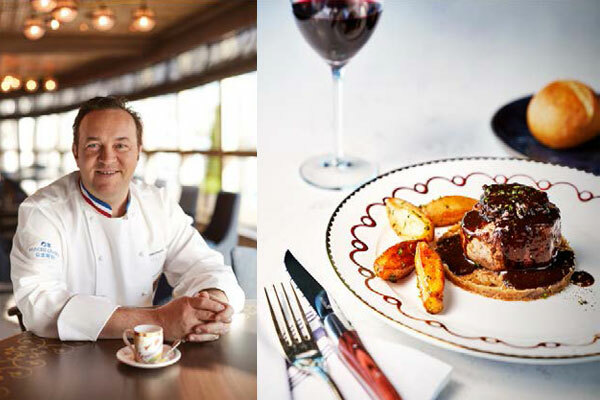 Marking the first time in the cruise line’s history, Princess Cruises will introduce a new French restaurant to North American guests. The debut of La Mer by Three-Michelin Star Chef, Emmanuel Renaut, onboard its next new cruise ship Sky Princess, will arrive in Ft. Lauderdale in December for an inaugural season of Caribbean cruises. Chef Renaut is owner and executive chef of the Flocons de Sel restaurant, located in the French Alps village of Megève. Flocons de Sel was awarded a third Michelin star in 2012, having earned its first in 2004 and a second in 2006. Before establishing the restaurant in 1998, Renaut worked in restaurants including Claridge’s, Hotel de Crillon and Auberge de l’Eridan. La Mer will offer casual, French bistro-style dining with a modern twist inspired by the flavours and feeling of the French Alps and contrasts from the ocean. The specialty restaurant will be located in the lively Sky Princess atrium. The restaurant first debuted onboard Majestic Princess in 2017 to rave reviews from international cruisers while the ship was based in China. A sampling of Sky Princess La Mer menu offerings include: Filet de Boeuf Poelé, Compotée d’ Ognons Doux, Jus au Vin Rouge, Frites; beef filet mignon, sweet onions sauté, red wine jus, hand cut fries; Quenelles de Vivaneau et St. Jacques, Salpicon de Homard et Jus des Carcasses; Red snapper & scallop mousseline, lobster morsels and lemon grass lobster sauce. La Mer will carry a cover charge of US$35 per person. This specialty restaurant will also debut onboard the cruise line’s next new ship, Enchanted Princess, in summer 2020.